This is a very successful initiative, however we understand it is not always possible for parents to provide un packaged lunches for your children on these days. Children can enjoy their food and any packaging or wrapping will be sent home in their lunchbox on these Wednesdays. The amended program was very successful and we will be presenting all the Champions with their medals tomorrow morning at 9.00am in the hangar. A full wrap up of all the events with pictures will be published on the school website over the coming week. Thank you to all the parents who helped with setting up, baking and selling cupcakes and packing up on the day. Also, the efforts of Mrs Putt and Mrs Kenny over a very long week are highly valued and appreciated. I strongly encourage parents to use parental control software on digital devices used at home. There is a range of filtering products available on the Australian market. You can search for products using terms like ‘filtering software’, ‘web filtering products’, ‘family filtering software’ and ‘parental control filters’. For more information visit the Government E Safety website. The space between the Education Support Centre and undercover area will be completed over the coming weeks. Save the date for our school open day and work viewing in Term 4 on Thursday 18 October 2018. Our Year 6 Student Leaders have initiated this fundraiser for Drought Relief. Kindy to Year 6 students are asked to come dressed as a farmer on Friday 7 September and bring a gold coin donation to help our Aussie farmers who are suffering through the drought. We have locked in the following date and time for our Pre-primary carnival. We are more confident of some beautiful weather and believe this will be a fun way to finish on a Friday. There will be cupcakes on the day so please let your class teacher know if you are happy to prepare some so we have an idea of amount. We will commence with flat race and we will have some of the upper primary students there also to watch and cheer them on. Thank you for your support, please e-mail Perisse.Pitsikas@education.wa.edu.au or call me should you have any queries. Visit our school website for more pictures and information. Kindy Photos will be taken on Monday, 17 and Tuesday, 18 September 2018. Envelopes will be sent home for Kindy students prior to this date with ordering code and instructions. Click HERE for more information from Kapture. Kindy school entry health assessments will be provided by the school nurse to all our Kindy children during the first week of the school holidays at the main school. If your child has not seen the school nurse yet for their assessment, please ring the school office on 9242 3677 to book your child’s appointment. Should you have any questions please contact the school nurse on 0407 492 368 Monday to Wednesday 9.00am – 4.00pm. Our 2 Year 5 netball teams came first in their divisions. They really did represent all of Mount Hawthorn Primary School values in all their games. After lunch on Friday 21 September students will walk to Menzies Park to run and raise vital funds for the school. Each year group will wear a different colour and it will be a fun way to finish off the term. Money raised will go towards Kiss & Ride shelters, trees and a campus map at the school entrance. Sponsorship Forms and information letters have been sent home with each child. Please be aware, the uniform shop will be closed for stocktake on Tuesday 18 September (last week of Term 3). Orders can still be made via Qkr or paper forms handed into the office but the shop will not be open after school. The Fathering Project was again busy with the Mount Hawthorn Mountain Goats running a successful sausage sizzle at Bunnings Main Street store. A big thanks to the helpers, especially Justin Bird who snagged a good deal on the sausages. The Goats also organised a fathers-and-father-figures pub night on 1 September where it was encouraging to see more new faces meeting up with like minded dads and hearing about the project. A date will be announced soon for the camp out in Term 4 and we have some other ideas up our sleeves too! Sign-up to our mailing list and/or check out our Facebook page for information about all our events. Due to the site works the Dental Van has not visited Mount Hawthorn Primary this year. As soon as space is available they will re commence their visits. Please do not contact the van to make appointments for check-ups. They can only see children who require urgent or emergency dental treatment. See attached flyer for Trackstars Term 4 at Mount Hawthorn Primary School. To register for Term 4 click HERE. 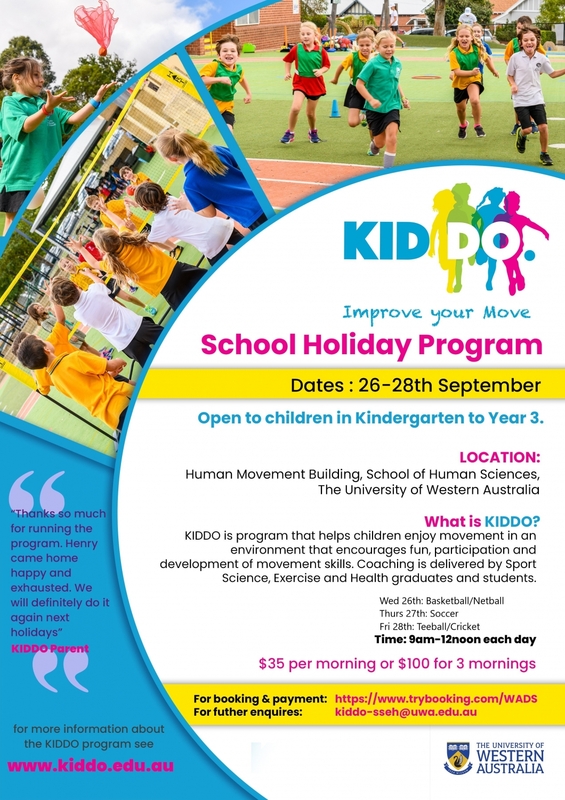 Offers a fun school holiday program at UWA from the 26-28 September 2018. From 9.00am – 12.00pm each day for children in Kindergarten – Year 3. The Battery Collection bin in the library will be emptied in the week commencing Monday 10 September. Please recycle your household dry cell batteries including AA, AAA (single use or rechargeable), C, D, button batteries, 9V and 6V.